SL200HT series is a drop shape analysis based surface chemical analytical system for extreme conditions such as temperature of 2000℃ or vacuum atmosphere, specializing in measuring surface tension and contact angle under ultra-high temperature, applied in research of mineral, metallurgy, ceramic, enamel, welding, semi-conductor, glass, alloy and coal and more. The super high temperature furnace, professional optical imaging system and precision adjustable mechanics enable it perfect device for analyzing contact angle between melt and solid or surface/interface tension between melt and air/inert-gas. 1. Contact angle measurement: The melted drop is usually shaped into an approximate ellipsoid in 3D due to its gravity, hence we adopt Young-Laplace equation fitting technology（ADSA™）to fit its shape in 2D, and then calculate its contact angle between melted drop and solid..
2. 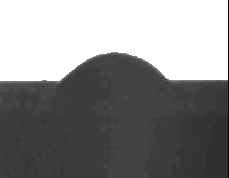 Surface tension measurement for melt under high temperature: For melted sample in high temperature, its surface chemical properties can be characterized by its drop shape profile; hence we here analyze it using Young-Laplace equation fitting method (ADSA™) via sessile drop method; melt volume and surface tension of melt can be calculated then. →Multi-layers are designed for thermal insulation. →Uniquely designed sampling system with movable sample brackets for loading sample conveniently and easily. It can be used to measure surface / interface tension and contact angle by sessile drop method and captive bubble method as well as surface / interface tension of liquid-gas / liquid-liquid by pendant drop method. (3) Unique interface tension measuring system of liquid-gas / liquid-liquid with Young-Laplace equation fitting method based on Bashford-Adams table, ADSATM(Runge-Kutta arithmetic and RealdropTM method) and capillary pressure method. 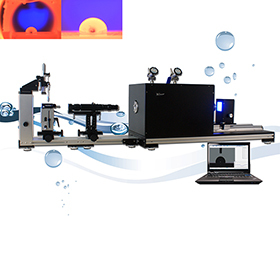 It can be used for surface tension measurement of medium-high viscosity sample, dynamic surface / interface tension measurement of surfactant, and oscillating drop measurement. -20 exclusive curve ruler methods, such as circle, spline, Gaussian and power. A 2D map of wetting envelope can be constructed by analyzing components of surface free energy with corresponding method (such as OWEN), and a plot produces to show how wettability occurs. It is another way of understanding contact angle, hence degree of wetting from perspective of force existing in the material and between the materials to understand. It can be used to automatically analyse time-dependent interface tension/contact angle/volume/wetting line, and image is one-to-one correspondence with data for you to conveniently analyse measured value at any time. - New-generation UI. Our software will implement measuring contact angle, surface free energy automatically at the touch of a finger according to wizard. Besides, with our 140-page user manual, you can operate the instrument easily without any professional training. - Unicode based software interface. Its English user interface can easily be changed between different languages (such as Simplified-Chinese), which makes it more convenient to operate. - Fully automatic. Just press “Measure”, images capture, contact angles calculation, data storage and real-time measured value display will be done without manualoperation. - Manual modification function. Double-click ”Modify”, you can modify measured value by captured image, and software saves the record of operation trace conveniently to avoid errors of automatic measured values. - Real-time graph. Left/right contact angle, average contact angle, adhesive work, surface free energy based on equation of state method can be real-time displayed without extra calculation. ü 5 drop shape state: Pendant drop , Sessile drop (liquid/gas, liquid/liquid/gas), Captive drop , Tilted Plate , and Oscillating drop. ü 7 methods to calculate contact angles: θ/2 (WH), circle fitting , ellipse fitting , RealDrop™ , curve ruler (tangent fitting ), Spline curve-fitting , and Young-Laplace equation fitting (ADSA-P™), etc. ü Data acquisition: combination of full-automatic measured values with manual modification. Just press “Measure”, the software will complete the whole process of capturing, finding edge, finding sensitive spots, fitting the curve, calculating contact angle values, and displaying the calculation results without manual participation so as to reduce the effect of human factors. ü Contact angle measuring technology: mathematical model fitting and real-drop contour measurement solves the problem of measurement of asymmetric drop shape or drop without apex. ü Automatic curved surface base line modification: modification of upper convex surface, lower concave surface, and roughness of surface. ü Dynamic/static contact angle measurement: measuring advancing / receding contact angle and tilting & roll off contact angle. ü Image capture methods: single / continuous capturing with 25 FPS. Higher speed of 60 FPS, 100 FPS, or 1,000 FPS are optional available. ü Unique dual-software triggering technology: measurement of first-time-point contact angle for analyzing powder, paper and other hygroscopic materials; whole-process shooting of small degree contact angle measurement. ü Calculation and comparison of left and right contact angle values and calculation of their average values. ü Automatically generated curve graph: real-time observation of contact angle changes. ü Powerful database management : one-to-one correspondence of data and drop images; backup, compression, and export to EXCEL files; measured values and curve-fitting results can all be saved into exported pictures, visually and clearly. Exclusively providing 12 methods for estimating surface free energy, e.g. Equation of State (Neumann et al. ), Good-Girifalco, Owen-Wendt-Rabel, Simple Fowkes, Extended Fowkes, WU method 1-2, Schultz method 1-2, Acid-base (Van OSS & Good), Jhu, Zhang, and Zizman Plot (critical surface tension) method, for measurement of free energy and its distribution (dispersive force, polar force and hydrogen bond value, and Lewis acid-base, etc.) of low/high free energy solid surfaces. 2. All rights reserved by USA KINO Industry Co., Ltd.